Watch how a vinyl record is made (in 60 seconds) | What Hi-Fi? 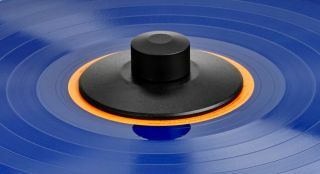 With the news that vinyl sales are now making more money than free streaming services, the format's resurgence shows no signs of slowing down - good news for record pressing plants. And while vinyl may be seen by some as an outdated technology - certainly the people behind the planned 'HD Vinyl' format might say so - the manufacturing process is certainly not a simple one. So we're grateful to The Vinyl Factory for demonstrating how a vinyl record is made, and in less than 60 seconds. The video (below) is shot at the company's own pressing plant on the site of The Old Vinyl Factory, a building synonymous with the music business. The Gramophone and Typewriter Company, the precursor to EMI, constructed the first buildings on the site in 1907, selling gramophones before turning its attention to manufacturing vinyl records in 1910. The home of the original His Master's Voice record label, out of which was born HMV, the the plant provided work for around 12,000 people at its peak in the 1960s and '70s, and manufactured records by the likes of the The Beatles, The Rolling Stones and Pink Floyd. Now you can take a look inside and see how it's done. Most of it. And you can take a closer look inside the plant in these pictures. Naturally a 60-second video can only tell you so much, so take a look at out our interview with a mastering engineer at Abbey Road Studios if you'd like to find out more.